Fort Pulaski (1829-1873) - Construction of this Third System fort began in 1829 under the supervision of Maj. Samuel Babcock assisted by 2nd Lt. Robert E. Lee (1829-1831). Named in 1833 after Count Kazimierz Pulaski who was killed in the siege of Savannah in 1779 during the Revolutionary War. Completed in 1847 after 18 years and almost $1,000,000. Fort Pulaski officially closed 25 Oct 1873. Part of the Harbor Defense of Savannah. Designed as a massive five-sided masonry Third System fort By Gen Simon Bernard, former Chief Engineer to Napoleon Bonaparte, to protect the city of Savannah, Georgia. 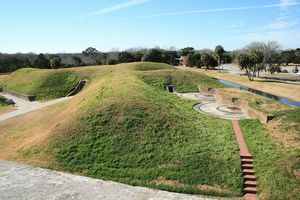 When completed in 1847 the fort could mount 146 cannons but by the start of the U.S. Civil War, only 20 were in place. Planning for the construction of the fort began in 1828 under the supervision of Maj. Samuel Babcock who was joined in 1829 by Lt. Robert E. Lee, on his first assignment. In 1830, Lt. Joseph K.F. Mansfield assumed supervision of the planning and in 1833 construction began on the wall foundations and timber support pilings. The brick fort walls were built 7 to 11 feet thick and 32 feet high. It took approximately 25 million bricks to complete the post. The interior of the fort was a single level of casemates with a gun deck across the terreplein on all five sides surrounding a large parade. A large demilune completely surrounded by water protected the main sallyport entrance and a moat surrounded the main fort structure. The Demilune was initially a flat triangular island that protected the main sallyport and contained support facilities like the kitchens, mess halls, and a guard house. The fort was placed in caretaker status with a single ordnance sergeant soon after completion and never garrisoned until the U.S. Civil War. Georgia State troops occupied the fort in Jan 1861 as the U.S. Civil War became inevitable and held it until 11 Apr 1862 when a Union bombardment breached the fort walls. 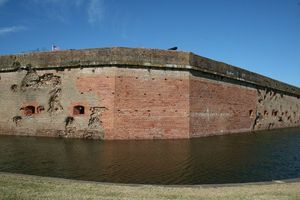 The breach of Fort Pulaski's walls by the new Union rifled cannons after 30 hours of bombardment signaled the end of the large masonry forts of the Third System. The breach in the southeast angle had exposed the north magazine and 40,000 pounds of powder to Union shells and exposed the fort to possible total destruction by a single shell. The 385 Confederate defenders under Col. Charles H. Olmstead surrendered at 2 pm on 12 Apr 1862 to Union forces under Gen. Quincy Gillmore (Cullum 1407). The fort was garrisoned throughout the rest of the U.S. Civil War by Union forces. The breach in the southeastern angle was repaired within six weeks by the occupying Union forces. Fort Pulaski then became a Union prisoner of war camp with a capacity of 336 prisoners but it came to house some 558 captured Confederates at one time. Thirteen of the prisoners died at Fort Pulaski and were buried across the moat from the north side of the demilune. 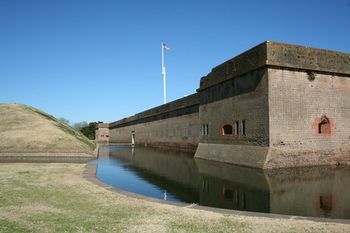 Fort Pulaski continued to serve as a prison for former Confederate officials and Union deserters after the end of the war. 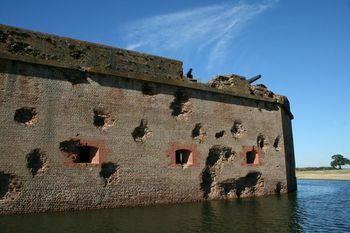 The fort was repaired and upgraded between 1865 and 1872, including magazines and a gun battery placed on the demilune and protected with earthen mounds. On 8 Oct 1873 the last Army units were withdrawn and the fort officially closed on 25 Oct 1873, leaving a single ordnance sergeant as a caretaker. Two Endicott Period batteries were constructed north of the fort during the Spanish American War period but appear to never have been armed or garrisoned. Fort Pulaski became a National Monument 15 Oct 1924 and was transferred from the War Department to the National Park Service 10 Aug 1933. The Civilian Conservation Corps (CCC) and the Works Progress Administration (WPA) restored much of the grounds and the fort itself before the beginning of World War II (1933-1941). The U.S. Navy established a section base on Cockspur Island for coastal patrol ships during World War II and that facility remained active until 1947. After World War II the fort reverted to National Park Service control and was placed on the National Register of Historic Places. Additional restoration work was completed after the war and a new visitor center was opened to the public 25 Oct 1964. Location: Cockspur Island, , Savannah, Georgia. Roberts, Robert B., Encyclopedia of Historic Forts: The Military, Pioneer, and Trading Posts of the United States, Macmillan, New York, 1988, 10th printing, ISBN 0-02-926880-X, page 232-236. Kaufmann, J.E. and Kaufmann, H.W., Fortress America: The Forts That Defended America, 1600 to the Present, DaCapo Press, 2004, ISBN 0-306-81294-0, page 254-257. Lewis, Emanuel Raymond, Seacoast Fortifications of the United States: An Introductory History, Naval Institute Press, Annapolis MD, 7th printing, 1993, ISBN 1-55750-502-0, page 50-51. This page was last modified 17:54, 16 April 2019 by John Stanton. Based on work by Bill Thayer.